Yes, in fact our daughter Kayla is the number one socializer- frequently she takes them out on the grass & plays with them. We all enjoy this part of breeding! Can Vizslas keep up with a long distance runner? Yes, in fact many of our puppy owners enjoy the breed because they are able to run with them. We’ve had quite a few marathon trainers enjoy the breed while training. How much activity does the breed need? All breeds need activity and the Vizsla breed is no different. 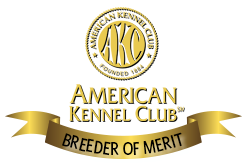 Are your dogs AKC registered? Yes. We provide paperwork when you pick up your puppy so that you can register it yourself with the name of your choosing. Yes. We do have a hip and health guarantee. Do your puppies have updated vaccinations? Yes. They are updated with 4 week and 6 week vaccinations. Can we come and see your facilities?